A bull elk migrating out of Yellowstone National Park into the lower elevation ranch lands for the winter. Its massive antlers catch snow as it brushes by trees. This photo was made with a motion-triggered camera trap. Elk migrating over a high mountain pass on the eastern boundary of Yellowstone National Park. This photo was made with a motion-triggered camera trap, and the elk did not know that they were being photographed. A pronghorn migrating south for the winter, caught in a wire fence. The photographer was able to pull the fence apart, setting the animal free. 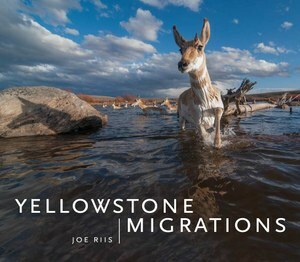 Pronghorn, mule deer, elk, bison, moose, bighorn sheep: All of these ungulates migrate seasonally through the landscape surrounding Yellowstone and Grand Teton national parks. They spend the summer foraging in high-elevation areas, then move to milder, low-elevation regions to survive the winter, all within the Greater Yellowstone ecosystem. 176 pages, hardcover: $29.95. Mountaineers Books, 2017.